For a brand that has for decades angled to become synonymous with breakfast, IHOP has really been on a fear lately trying to get people to think it can do a lot more. First, it pulled of a wild marketing stunt by temporarily rebranding itself as IHOB and slinging burgers, and now, it's branching out into the world of booze. The International House of Pancakes is officially trying its hand at making beer with its very own pumpkin spice pancake stout. Meet IHOPS. The new autumnally appropriate alcoholic beverage is the byproduct of a partnership between IHOP and Keegan Ales, a brewery based Hudson, New York. Though it's hardly the first pumpkin beer to hit the scene, it's described as being inspired by the chain's pumpkin pancakes. 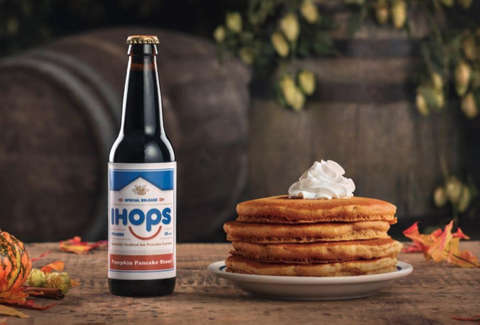 However, anyone hoping to pair their next stack of flapjacks with a cold one is going to be a bit disappointed, because IHOPS won't actually be on the menu in any of the chain's restaurants. It will only be available on tap at select bars and events in the Tri-State area during the fall season. That means if you're desperately jonesing to sample this pumpkin-y, pancake-y dark beer, you'll have to head to the Hilton Hotel Brooklyn, Beer Culture, Top Hops, or any of the other spots listed among the places and events where it'll be up for grabs. Then again, if you're really feeling like a proper pairing, you could presumably order IHOP pancakes to go and then bring them to the bar. Kind of makes you wonder what else IHOP has up its sleeve. Deodorant?